Political scientist Larry Sabato once said, “Every election is determined by the people who show up.” Though the quote is at first blush rather banal, it carries profound implications for American democracy. 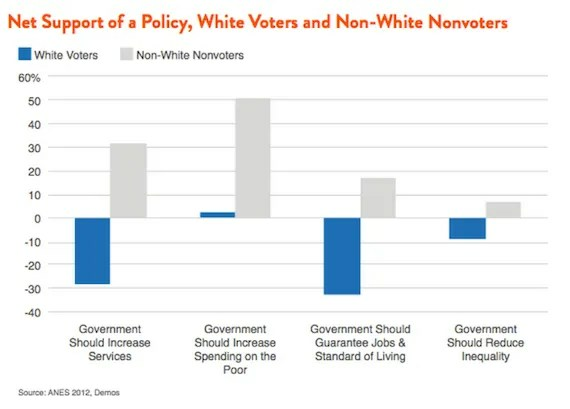 In my latest report for Demos, “Why Voting Matters,” I argue that who votes has profound implications for policy. I argue further that contrary to the view espoused by many political scientists, voters are not a “carbon copy” of the electorate, but rather older, whiter and richer — and therefore more conservative. Who votes? 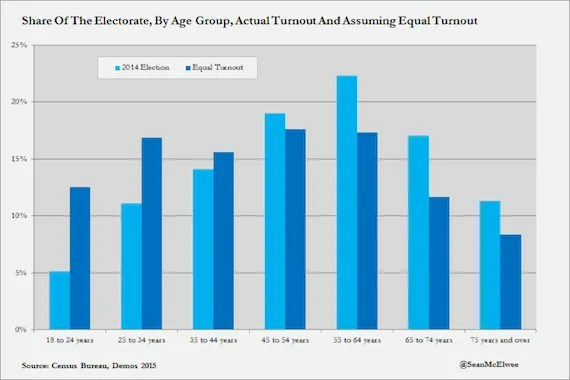 Using data from the 2014 midterm, I find that there are large class and age gaps in voter turnout. 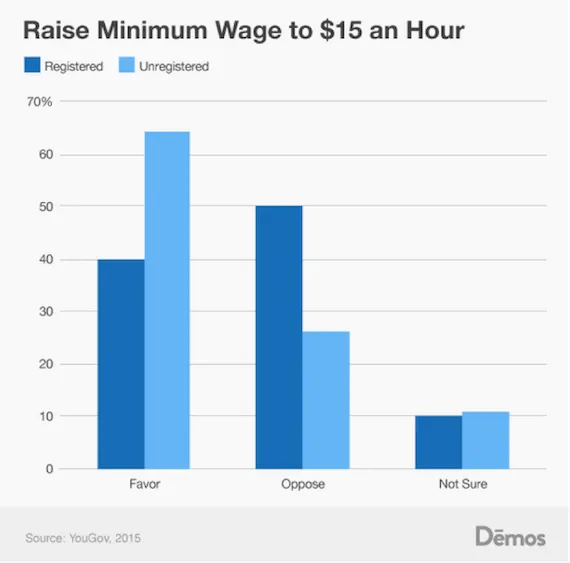 To take one jarring statistic, while 52 percent of those earning above $150,000 voted, only 1 in 4 of those earning less than $10,000 did. Class gaps are magnified by age gaps. 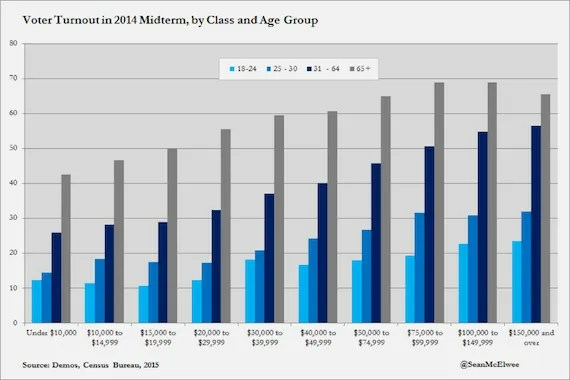 Among 18-24 year olds earning less than $30,000 turnout was 17 percent in 2014, but among those earning more than $150,000 and older than 65, the turnout rate was nearly four times higher, at 65 percent. 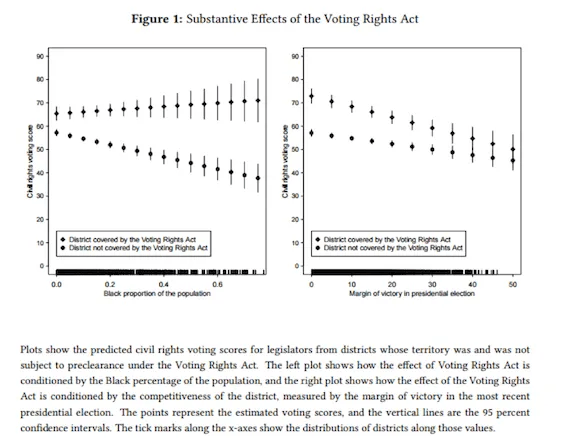 A recent study by political scientists Ryan Enos, Anthony Fowler and Lynn Vavreckexamines how “propensity to vote” correlates with policy views. They find that a one standard deviation increase in the propensity to vote (15 percentage point change in the chances of voting) is correlated with a $6,000 increase in family income, a 3 point increase in support for G.W. Bush, a 4 point decrease in support for a higher minimum wage, a 2 point decrease in support for affirmative action, a 2 point decrease in support for federal housing assistance. 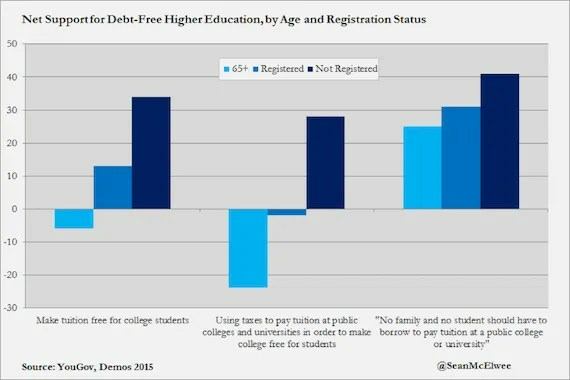 All of these are statistically significant, and strongly suggest that on many key issues voters are more conservative than non-voters. 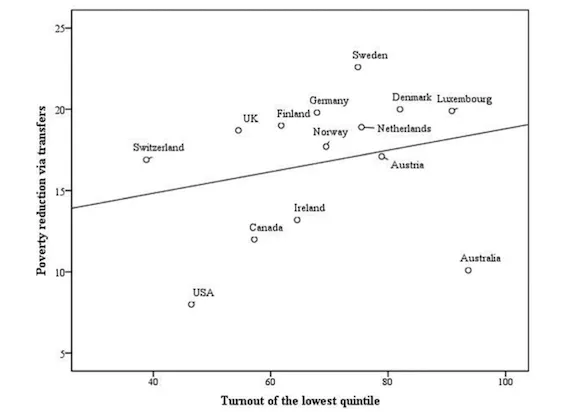 In a recent article, historian Rick Perlstein puts the American voter turnout problem in historical perspective. He notes that Jimmy Carter warned in 1976 that “millions of Americans are prevented or discouraged from voting in every election by antiquated and overly restricted voter registration laws.” Carter then proposed a battery of reforms: universal election day registration, aid to help states implement the law, more robust public financing of elections and an abolition of the electoral college. However, not all Republicans supported the proposal to make the vote easier. Ronald Reagan wrote that it would “invite wholesale election fraud, restrict effective challenges to incumbents and render the Republican Party as dead as the Dodo bird.” As it happens, none of his claims were true then, and none are true today. Evidence of voter fraud is vanishingly slim, and Carter’s proposal actually pushed for measures to reduce fraud. 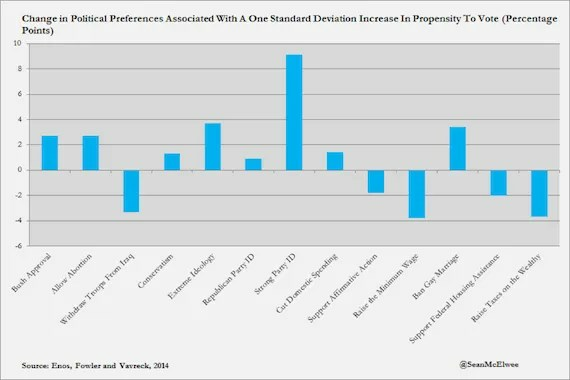 Research shows higher voter turnout doesn’t benefit incumbents; indeed, low voter turnout entrenches them. Finally, it’s unlikely that voter turnout would cause an end to the two-party system. 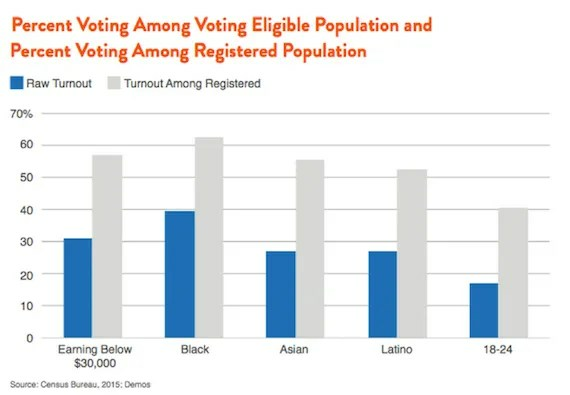 Rather, higher voter turnout would force both parties, Republican and Democrat to move more in line with the preferences of the American population at large, rather than the whiter, older and richer voting population. Reagan’s opposition to Carter’s proposal is not entirely surprising. New research I’veexplored elsewhere shows that “The Reagan team assembled little data on the middle- and lower-income groups as it focused intently on gathering information on the affluent.” That is, Reagan used internal polling to ensure that his policies were in line with the preferences of the wealthy, not average Americans. His agenda, then, would certainly benefit if the people he ignored weren’t able to push him from office. 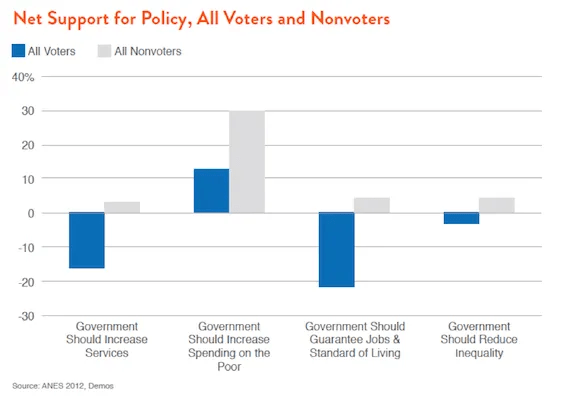 There are differences in partisan affiliation between voters and nonvoters and voters, but the strongest differences are on the role of government in the economy and support for progressive causes (see chart). More voter participation would force both political parties to address deepening concerns about rising income and wealth inequality. This entry was posted in Politics, Voting and tagged why voting matters on February 11, 2016 by seanadrianmc@gmail.com.